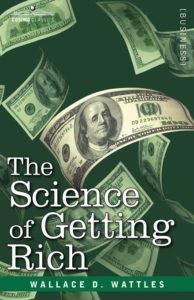 Wallace D. Wattle, author of the Science of Getting Rich, believed that by Acting in the Certain Way, our thoughts are the impelling force which causes the creative power to act. Wallace was a pioneer in realizing and writing about the power of your mind. In part 7 of my video series on his groundbreaking work, I cover how by Acting in the Certain Way it will bring riches to you. But, he says, you must not rely upon thought alone; paying no attention to personal action. The failure to meet thought with personal action is the downfall of many people. So, we must not only think, but we must act on our goals too. By thought he believes, you can cause the gold in the hearts of the mountains to be impelled toward you. But it will not mine itself, refine itself, or coin itself into double eagles and come rolling along the roads seeking its way into your pocket. Wallace says that your thought makes all things animate and inanimate work to bring you want you want; but your personal activity must be such that you can rightly receive what you want when it reaches you. That Formless Substance, explains Wallace, has the same desire for more life that you have; upon receiving your vision, sets all the creative forces at work in and through their regular channels of action but directed towards you. Therefore, you must act in a Certain Way so that you can appropriate what is yours when it comes to you. You can meet the things you have in your picture and put them in their proper places as they arrive. This is the crucial point in the Science of Getting Rich where thought and personal action must be combined. Now you must provide for the reception of the thing you want when it comes. By thought, the thing you want is brought to you; by action you receive it. Put your mind into present action. Think in the now and begin to make ready for the reception of what you want. And your action, whatever it is must be in your present business and must be upon the persons and things in your present environment. Hold with faith and purpose the vision of yourself in the better environment. But, act upon your present environment with all your heart and with all your strength and with all your mind and act now. Your vision and faith will set the creative force in motion to bring it toward you and your action will cause the forces in your environment to move you toward the place you want. Remember, Wallace says there is a thinking stuff from which all things are made and which in its original state, permeates, penetrates, and fills the interspaces of the universe. A thought in this substance produces the thing that is imaged by the thought. In order to do this, you must move from the competitive to the creative mind. You must have a clear mental picture of what you want. Hold this picture in your thoughts with fixed purpose and unwavering faith. And you must act now and take efficient action which we will cover in the final part 8.